The school follows curriculum guidelines established by the B.C. Conference of Seventh-day Adventists and in harmony with the requirements set by the B.C. Ministry of Education. The Seventh-day Adventist, North American Division Department of Education, develops Reading, Bible, and Science/Health curriculums used. Other courses offered by WCAS follow the British Columbia Ministry of Education guidelines from a Christian perspective. FSA (Fundamental Skills Assessment)-Spring- Grade 4 and 7 The FSA tests as designed by the Ministry of Education are required and it is expected that all students in the affected grades will participate. Contrary to reports in the media the FSA are not optional. Students in Grades 10-12 participate in the Provincial Examination program as required by the BC Ministry of Education. Arrangements will be made in one of the following ways for students to be able to write the Provincial Exams for the courses in which they are enrolled. This program is based on an element of trust, as assignments are completed at a distance, without the teacher providing direct supervision. When students are taking a test, it is expected that parents will provide supervision to ensure the students are using only the materials and resources that the teacher is expecting them to use. As well, work that is handed in is expected to be the student’s own work. Teachers regularly check on the Internet to see if student work has been copied from other sources. In cases where the teacher finds that cheating has been taking place, the student will receive no grade for that assignment, will address the issue with the student and the parent, and will notify the administration this has happened. If there are recurrences of this practice, the student will be withdrawn from all courses with WCAS, and may not be allowed to re-register with the school in the future. and the retake request must be received by the teacher within five business days of receipt of the assessment or assignment results. WCAS provides the opportunity for up to two resubmissions per assignment. WCAS provides the opportunity for one retake per unit test or major project. Students must submit the “WCAS Retake Application” form to be eligible to retake unit tests and major projects within five business days of receiving the initial mark. The maximum grade a student can receive on a unit test or major project that has been retaken is 85%. Christian Home Schooling is a growing concept and one that the Board and Administration of WCAS recognizes. At this particular time, we are not accepting registrations from Home School Students. WCAS recognizes the potential of distributed learning for home school students but we are not yet equipped to serve these families. Preparing now will help ensure you get the credits you need to achieve your goals. Graduation requirements are introduced in Planning 10. French 11 or a modern second language is a requirement for entering most universities. Take steps to confirm what your university requires. In keeping with the Ministry guidelines for reporting student progress WCAS reports progress differently a various grade levels. In the early years student progress is reported in the context of what can be expected from children at that particular level of learning and development. The categories that your will see in reports cards and other communication will compare a students progress compared to students generally at that level. As students approach the end of the school year most will be “Meeting Expectations” while very few would “Exceed Expectations”. The instructors will be able to communicate ways your can support your child’s learning and will be ready to discuss this with you informally as well as including this kind of information in formal report cards. • three formal written report cards (December, March and June). The formal written report follows the requirements for the specific grade and program as stated in legislation and policy. One formal report shall be made at the end of the school year. Formal reports identify student progress and are placed in the Permanent Student Record file. • three informal reports each school year (October, February and May). At least three informal reports must be provided to parents each school year. High School students will receive four formal written reports (November, February, April and June) and four informal reports (October, December, March and May) each school year. Formal reports communicate to parents and students significant aspects of the students’ progress in the areas of intellectual, social, human and career development. Use of the performance scale to show progress in language arts (including reading, writing, and speaking/listening), mathematics, social studies and science is mandatory. The performance scale may also be used to report progress in other areas, such as fine arts, personal planning, physical education, social responsibility and work habits. 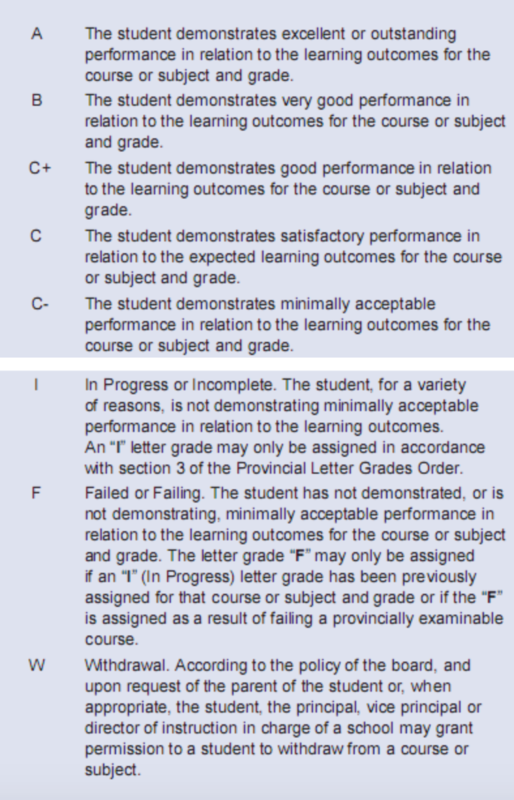 Criterion-referenced letter grades in Grades 10 to 12 indicate students’ level of performance in relation to the prescribed learning outcomes set out in provincial curriculum guides for each subject or course and grade, and the learning outcomes for board authorized courses and independent directed studies. 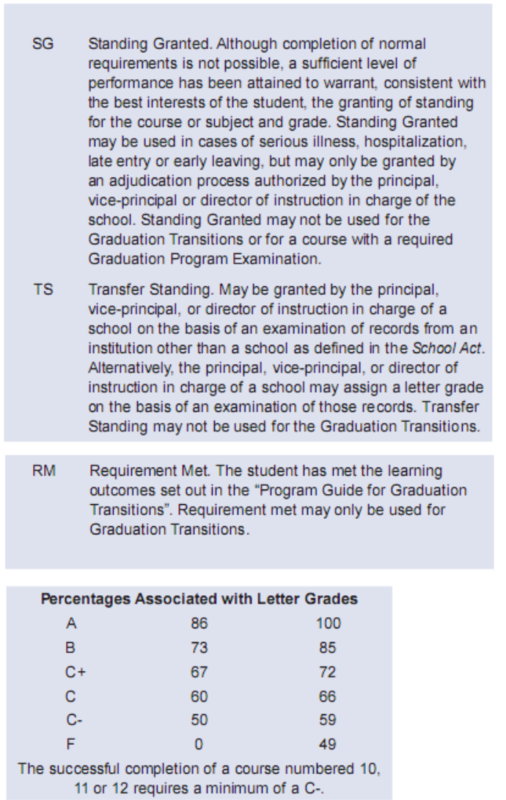 Letter grades must be included on report cards in Grades 10 to 12. The following may be used on final reports in Grades 4-12.